Ship model for bonding. Size: 1: 146; 43.5 cm. The package contains: 191 pieces for gluing. 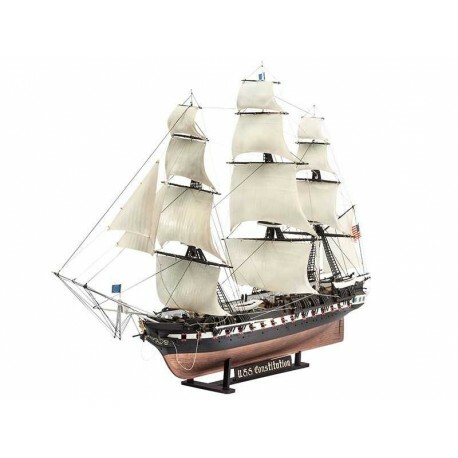 The USS Constitution was the first ship built for the United States Navy. During the war in 1812 she earned the nickname "Old Ironside". The salvage of the HMS Guerriere warship then bounced off the hull of the Constitution as if the ship were made of iron rather than hardwood. On the contrary, the Constitution destroyed its subsequent Guerriere fire. Throughout its long service, the enemy has never been able to get on board. It is still possible to inspect the Constitution in the Boston Harbor, where it swings on the waves as a glorious symbol of the then-young, but courageous nation. Recommended for children from 13 years of age.